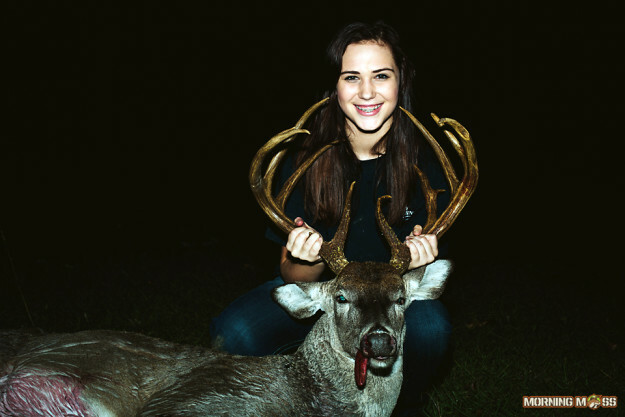 Some big bucks fell over the Thanksgiving weekend and that made for some very happy hunters, but you’d have a hard time finding one as happy as 15 year-old Aaliyah Meshell, who downed a 12 point buck in Sabine Parish, Louisiana on Thanksgiving afternoon. Keep reading to hear the story of how she killed this monster Louisiana buck in her own words. Well, today has been a thanksgiving for the books for sure! I spent my morning with my wonderful family. came home and dad told us we could split up and go on hunts. Got on the stand around 4 & killed my lifetime buck just around an hour & a half later!!!!!!! I didn’t know what to do but just cry. Never have I ever been so proud of myself. What made it so special is it was right at home and on Thanksgiving! I can’t wait to get this sucker mounted. I am forever so thankful for the people God has blessed me with in my life! Also, I’m pretty thankful for this awesome buck too. Aaliyah Meshell and her father are pictured with her large 12 point buck. Congratulations Aaliyah on a great buck and we hope that you manage to shoot another one that’s even bigger sometime in your life. Check out more big buck stories and photos.